Pope St. Simplicius was Bishop of Rome in 468-83, one of the most turbulent periods of the history of the City, during which the last Western Roman Emperor was deposed. 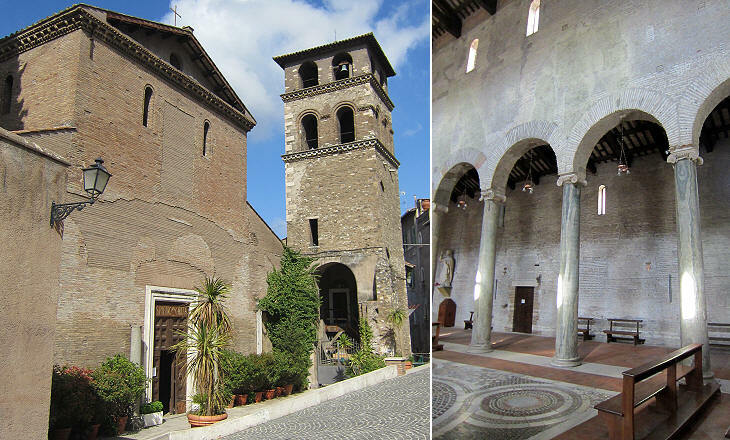 Simplicius is known for having turned a Roman building into S. Stefano Rotondo and for having founded some churches in Rome including S. Bibiana. He was a native of Tivoli and he promoted the construction of several churches in his hometown. According to tradition the church was erected where a Christian community founded by St. Peter used to gather. As a matter of fact it was built on the grounds of a Roman villa. The church was modified in the XIth century and in 1730 its appearance was redesigned in line with the style of the time. In May 1944 the church was bombed and its roof collapsed. The reconstruction highlighted its medieval aspect as much as possible and all additions were removed. The lower part of the bell tower is dated XIIth century whereas its two upper storeys were added in the XIVth century. The second remaining church founded by Simplicius is dedicated to Pope St. Sylvester, but the dedication was most likely established in the XIIIth century, when the figure of this pope acquired an enormous importance for the Roman Church because of the Donation of Constantine, a medieval document according to which Emperor Constantine donated the Empire to Sylvester. The original building was similar to S. Pietro alla Carità, but in the XVIIth century its left nave was demolished to enlarge the street which gave access to Tivoli from Rome and its right nave was demolished to enlarge the parish offices. In 1767 the cipollino columns which once separated the naves were sold to Cardinal Alessandro Albani, who at the time was building a large villa in Rome. 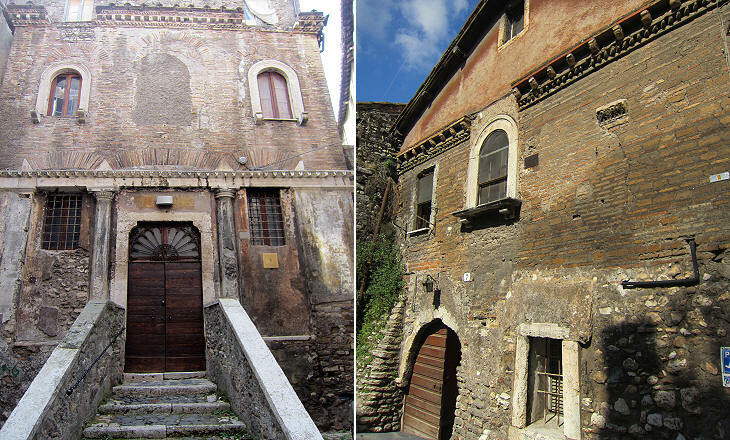 (left) S. Stefano ai Ferri; (right) "Casa Bizantina"
Pope St. Simplicius is credited with having built S. Stefano ai Ferri, probably on the site of a temple to Isis. It was modified in the XIIth century. In the XIVth century the central window was walled-up. In 1840 the church was deconsecrated and utilized for different purposes including as a granary. A medieval building near S. Silvestro is believed to have been a church. 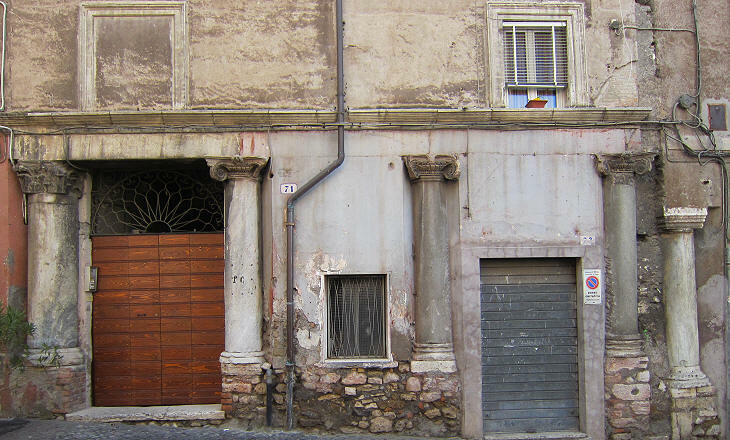 It is called "Casa Bizantina" because of its brickwork decoration, similar to those of S. Stefano ai Ferri and of S. Saba, The latter was built when Rome was a Byzantine Duchy, however this type of decoration was first developed to embellish ancient Roman buildings, such as some tombs along Via Appia. The abundance of ancient columns and capitals in the medieval parts of Tivoli is explained only in part by the monuments of the Roman town. Villa Adriana, the large villa built by Emperor Hadrian three miles from the town provided a never ending supply of construction materials. Because Hadrian wanted his villa to remind him of the many parts of the Empire he had visited, he embellished it with columns from different countries which had capitals of different styles. 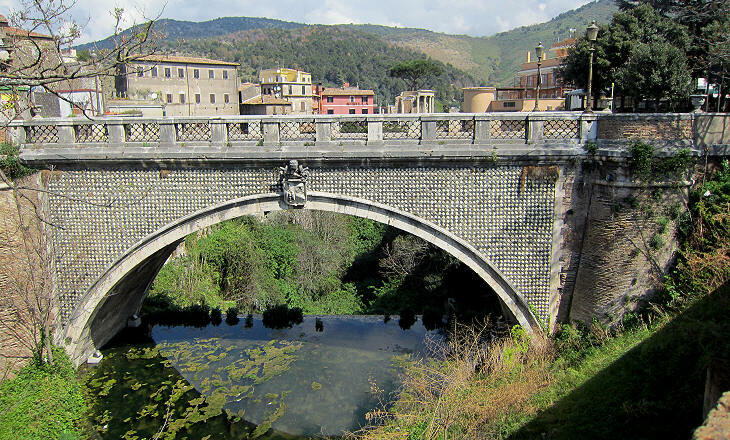 In the general decadence of the Italian towns after the fall of the Roman Empire, Tivoli is an exception, as the town in the XIIth century expanded beyond the ancient Roman enclosure and new walls and a new gate were built. Tivoli sided with the German Emperors during the Investiture Controversy and it tried to become the most important town of Latium, but, owing to the death of Emperor Frederick II in 1250 and to the consequent weakening of the imperial party, Tivoli lost its independence in 1259. 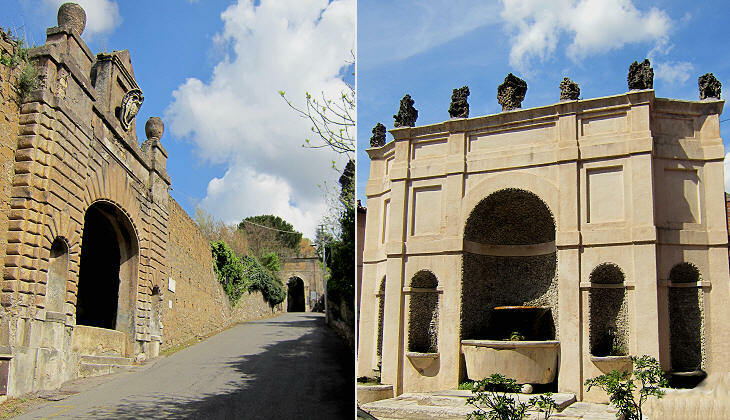 The buildings near Porta del Colle, the new gate, offer a variety of medieval architecture which in Latium can only be compared with that of Viterbo. Until the middle of the XIXth century the aspect of this medieval quarter was regarded as miserable ("a squalid town" in the words of Charles Dickens). Towards the end of that century what was miserable became "picturesque" and painters such as Alberto Pisa illustrated "Casa Gotica" in English books. The wealth of an Italian medieval town was expressed by the size and decoration of its Duomo (Cathedral). Because at Tivoli S. Lorenzo, the cathedral, was entirely rebuilt in the XVIIth century, S. Maria Maggiore is the most interesting monument of medieval Tivoli. 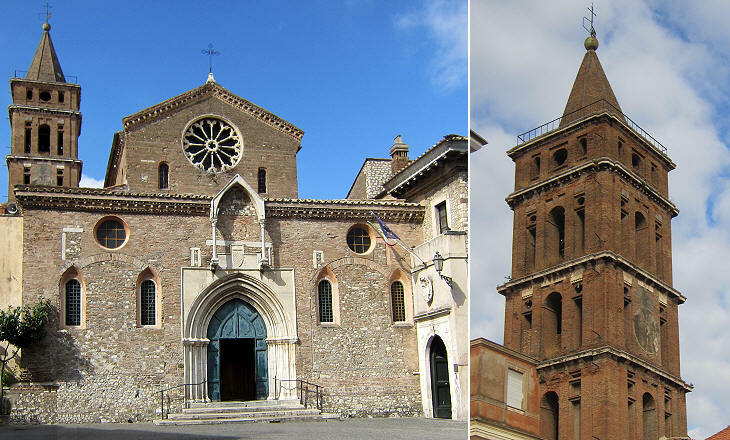 The church was initially built by Benedictine monks in the IXth century (at Subiaco, not far from Tivoli, St. Benedict lived as a hermit for years). During the XIIth century the building was entirely redesigned and its orientation was reversed. The great marble portal was added in 1392. Eventually the church and the adjoining monastery were assigned to the Franciscans. The imposing bell tower was built in 1590, intentionally designed to resemble that of the Cathedral. The interior of the church is marked by the presence of a narthex which is a rather unusual feature in Italian medieval churches. An elegant Gothic arch leads to the main nave. The right nave of the church which housed chapels of the guilds of Tivoli was pulled down to make room for the palace built by Cardinal Ippolito II d'Este between 1550 and 1570. 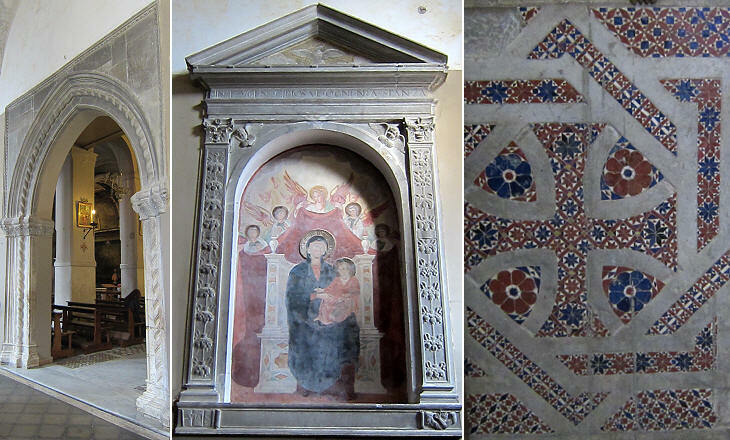 Some of the works of art, such as a fine Renaissance frame, were removed from the naves and placed in the narthex. The bell tower of S. Lorenzo was built in the XIIth century in the Romanesque style which characterized most of the bell towers of Rome. The church was entirely rebuilt in 1635-41, but its interior was mainly decorated in 1816 by Carlo Labruzzi, a painter who in the early part of his career earned his living by accompanying Grand Tour travellers on their journeys and making sketches of the monuments they saw (he acted as a human camera). Castrovetere (old castle) is the medieval name of the ancient acropolis of Tivoli. It could be accessed only through one gate located at the end of a drawbridge. The quarter is still very detached from the rest of the town. 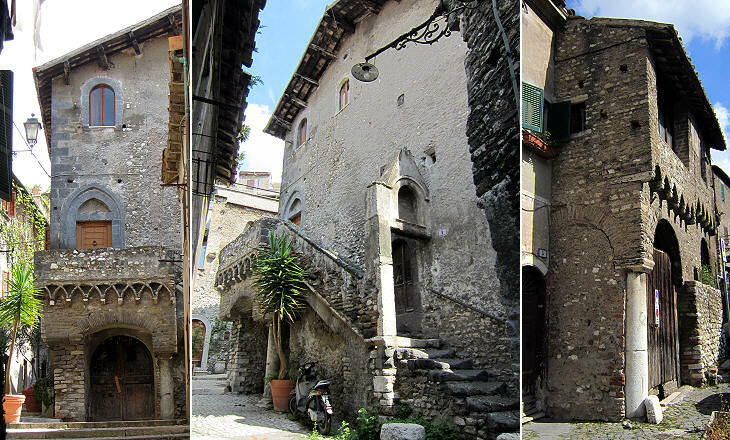 In addition to medieval houses Tivoli retains several interesting examples of minor Renaissance buildings. The curved shape of portal and windows is typical of the Early Renaissance and in Rome it can be seen in the Florentine quarter (centina - centring - is the name of the half-moon wooden support utilized during the construction). Later types of Renaissance windows had a decorated lintel, often bearing the name of the owner (see that at Palazzo Cisterna in Rome). A window partitioned by a marble cross was utilized for the construction of Palazzo Venezia. 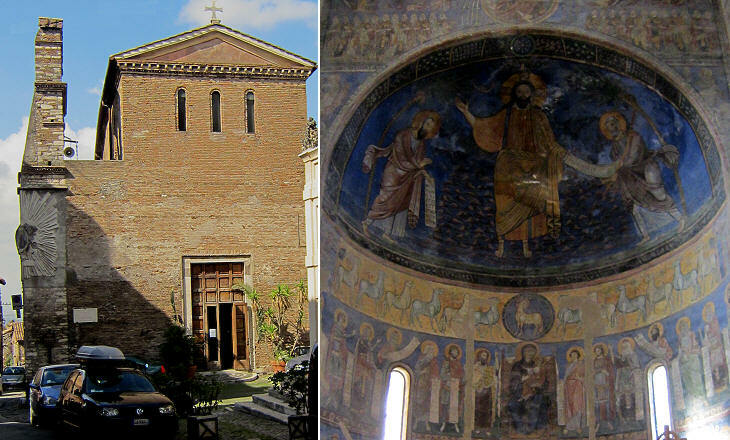 S. Biagio was a medieval church the interior of which was entirely redesigned in 1887. It was greatly damaged by bombings in 1944. Luckily its elegant Renaissance portal was spared. It was built in 1516 by Vincenzo Leonini, an inhabitant of Tivoli who was the husband of Bartolomea de' Medici, niece of Pope Leo X, the reigning pope. The portal of the Seminary of Tivoli was designed in 1647 and it shows the tendency to break the composed Renaissance design to introduce new decorative elements, in this case an inscription and the coat of arms of Cardinal Giulio Roma. 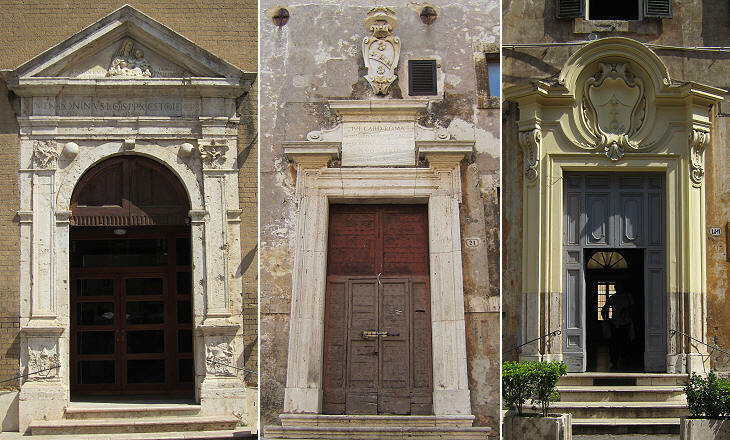 The third portal shows a change in design which can be noted in many Roman buildings, such as the entrances to the Monastery of S. Carlo alle Quattro Fontane and nearby Palazzo Galloppi. In 1549 Cardinal Ippolito II d'Este was appointed governor of Tivoli by Pope Julius III. He was a very ambitious man. He was the grandson of Pope Alexander VI (his mother being Lucrezia Borgia) so he had Spanish blood in his veins, but from a political viewpoint he was French. At the six conclaves he took part in he never managed to obtain the indispensable support of Spain. The ambitions of Cardinal d'Este were made explicit by the construction of Villa d'Este, a palace surrounded by gardens that surpassed those built by popes and monarchs. He did not care much about Tivoli because his guests did not need to enter the town to reach Villa d'Este, because the access to the gardens was situated immediately outside the gate of the town. The guests who wanted to reach the palace directly, would enter the gate, but they would turn right at a decorative fountain and access the palace by a nearby entrance, without seeing much of Tivoli. 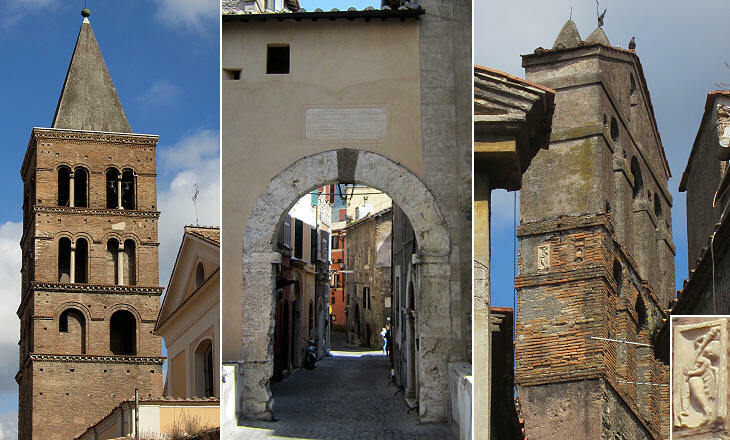 Tivoli has many sacred images of different periods: the sequence of sacred images shown above shows the development in framing these images from the very simple medieval approach to the elaborate XVIIIth century stucco aedicule. You may wish to see a page on the sacred images of Rome. In 1461 Pope Pius II placed Tivoli under the direct authority of a papal governor and he built the Renaissance fortress you see in the background of this page (click here to see it in a page on the Fortresses of the Popes). Ludovico Agnelli was one of the first governors of the town and an inscription under his coat of arms provides some information on minor aspects of the history of Tivoli, such as when the first public clock was installed. The Cenci were one of the most important Roman families in the XVIth century and they had many possessions in and around Tivoli, including the castle of Petrella Salto, where in 1599, Beatrice Cenci and her brothers arranged the killing of their father Francesco. 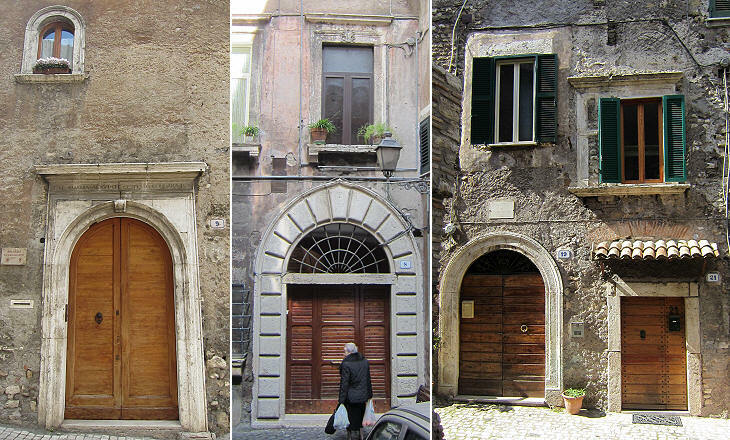 The Lolli established themselves at Tivoli in the XVIIth century; the three identical heads of their coat of arms most likely gave the name to Via dei Sosii, the street where their palace is located. sosia is the Italian term for look-alike and it derives from a character of Amphitryon, a play by Plautus, where Jupiter changes his appearance to look like Sosia, a slave in Amphytryon's house. Tivoli is located on the Aniene valley where the river goes through a gorge and it forms a series of waterfalls. These waterfalls have been harnessed since antiquity as motive power for mills and they contributed to the development of the town as a manufacturing district. Occasionally landslides along the narrow gorge obstructed the passage of the water and Tivoli was flooded. Following a major flood in November 1826 Pope Gregory XVI promoted the digging of a tunnel which created a new large waterfall outside Tivoli. On the occasion a new bridge across the Aniene River was built and the area near the waterfalls was redesigned. It is known as Villa Gregoriana and it is open to the public (see their website - external link).